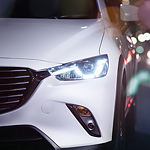 The Mazda CX-3 is packed with a few useful technology features that motorists are raving about. Come visit our dealership so you can see this popular subcompact crossover and experience these features for yourself. Transform your driving experience when you utilize the entertainment system. Listen to all your favorite music in a way you could have never imagined with the BOSE 7-speaker surround sound system. Now you'll be able to experience classical, rock, or metal, in a way that you have never before, all while cruising down the road in your all-new Mazda CX-3. One reason for the explosion in popularity of the new Mazda CX-3, this vehicle can actually make driving safer. Instead of needing to look away to perform certain tasks in the cabin, it is all up close and personal. The Active Driving Display puts information like your speed and navigation instructions right below your normal field of vision.